Always On VPN was a bit of a misnomer when it was released, as it was only really ‘on’ when a user logged on. So when comparing it with ‘Direct Access‘ it didn’t have the capacity to ‘Manage Out’. With the release of Windows 10 (1709) this has been rectified with ‘Device Tunnels’, (more on that later). 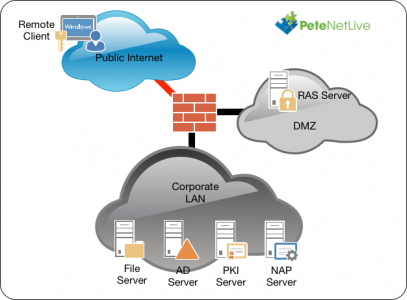 The solution uses RAS, NAP (NPS), and PKI (Certificate Services). 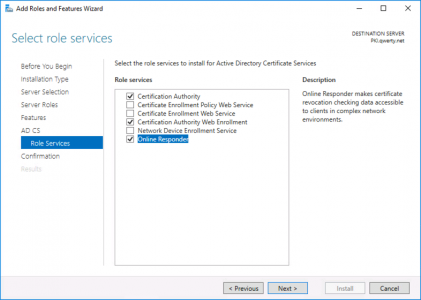 Obviously Active Directory is a requirement, and in addition I’ve also got a file server setup just for ‘testing’ access to domain resources. Note: The VPN setup, (on everything, apart from the Windows 10 clients), is just the same as it ever was. 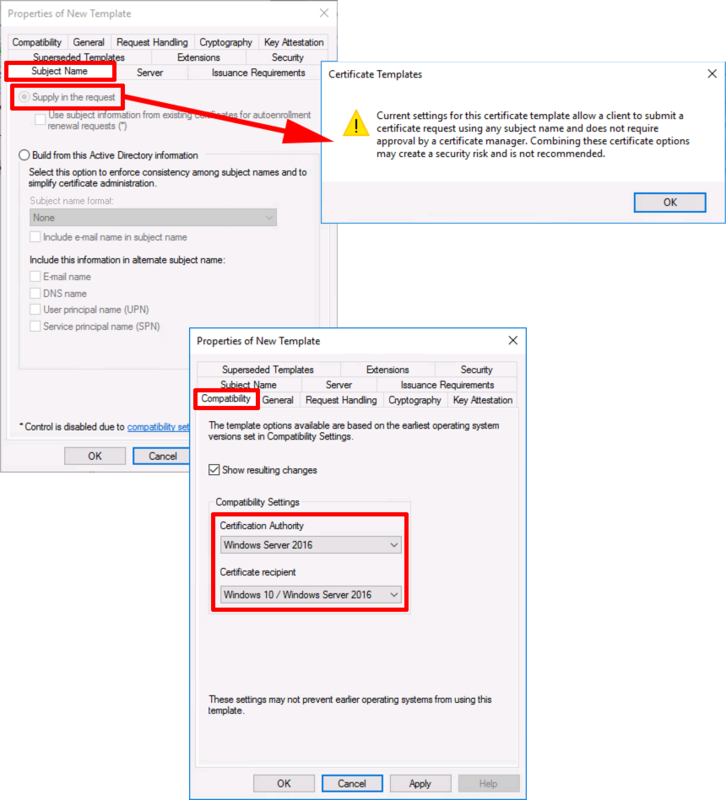 This technology is for copying VPN settings from a Windows 10 client, and then being able to put those settings on other Windows 10 clients, so that when a user logs on, the VPN connects (User Tunnels), or when a machine gets a network connection it connects (Device tunnels). Note: You can of course use ‘domain users’ if you are rolling this out domain wide. 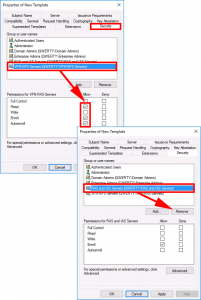 Add your NAP/NPS server(s) to the VPN-NPS-Servers group, (remember you need to add computers to the search criteria, or you wont find them). Add your RAS server(s) to the VPN-RAS-Servers group. Add your domain users(s) to the VPN-Users group. PLEASE: Don’t just race forward and install Certificate Services. Every domain certificate problem I’ve ever had to worked on has been the result of someone ‘just lashing it in’. 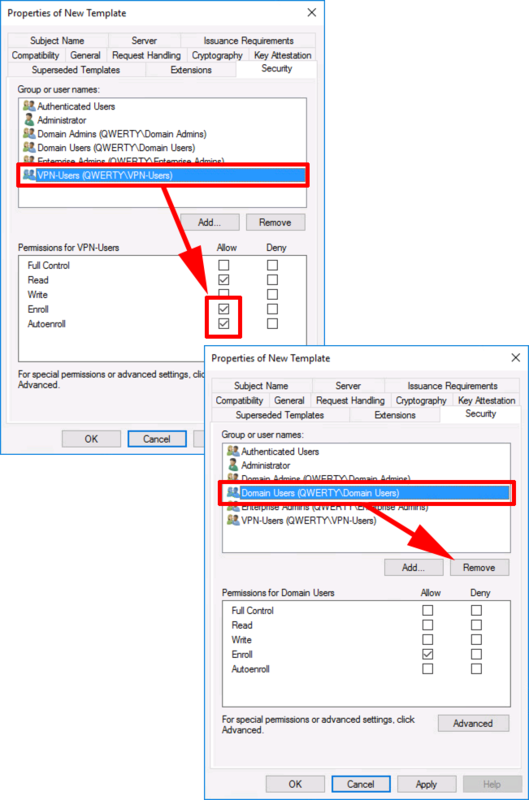 Take the time to do it properly, and think about your domain PKI design, consider things like, Offline Root CA’s, Multi-Tier Sub CA’s, CRL, and OCSP. If you are simply setting this up on the test bench, or for a POC, (in a non-production domain). Then add the role from Server Manager. These are the roles I deploy, but for this solution you only really need the Certification Authority, role. Note: If you are interested what the other roles do, then search for them above, (I’ve blogged about NDES, and the Enrollment Web Services before). 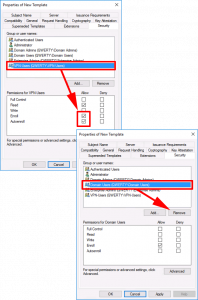 VPN-User Certificate: Open the certificate services management console > Certificate Teplates > Manage > User > Duplicate Template. Publish certificate in Active Directory UNTICK. Providers: First: Microsoft Platform Crypto Provider, Second: Microsoft Software Key Storage Provider. 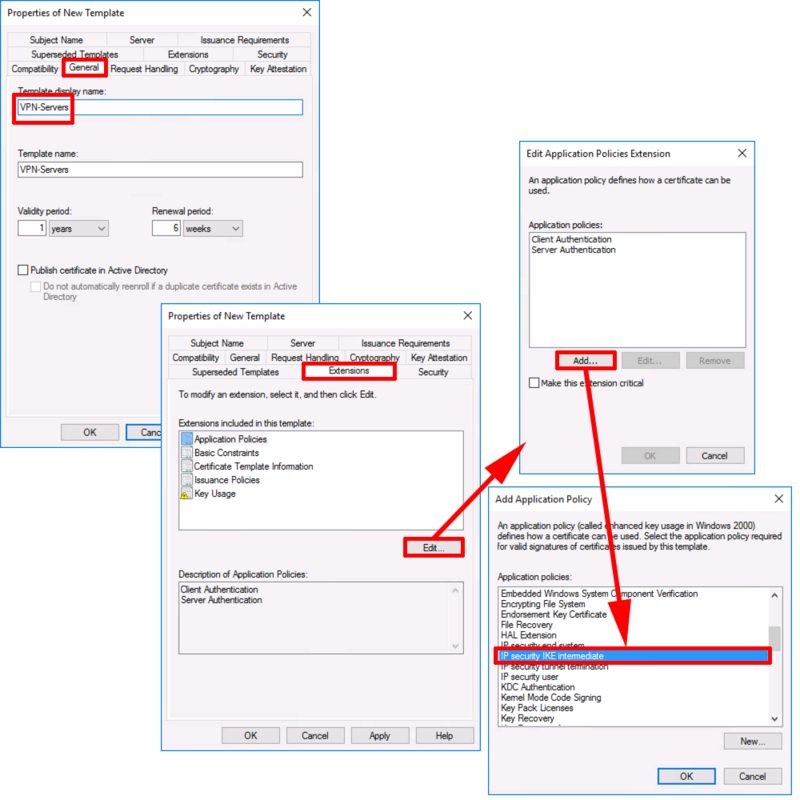 Note: Theres two because the first one requires a TPM chip, if the client machine does not have one the procedure fails. 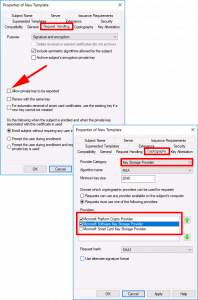 By allowing ‘Microsoft Software Key Storage Provider’ if will ‘fall-back’ to that option, if there is not TPM chip. ADD: VPN-users: GRANT: Read, Enrol, and Autoenroll. Note: In a test environment, you may also want to UNTICK the option ‘Include e-mail name in subject name‘ on the Subject Name tab or you may see this problem. 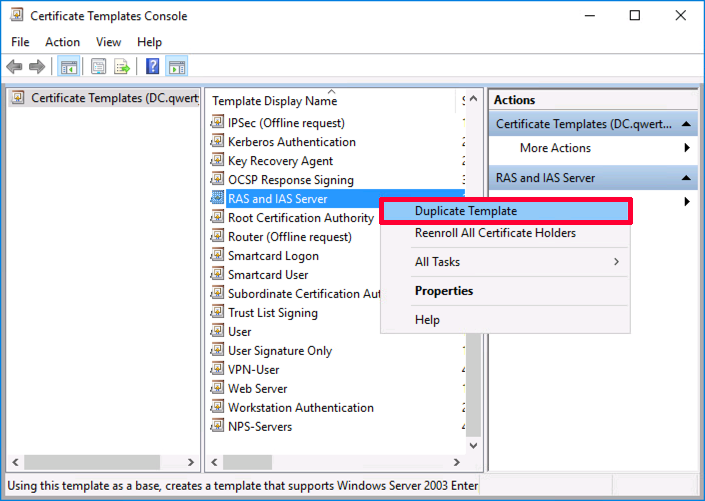 Repeat the procedure but this time make a duplicate of the RAS and IAS template. 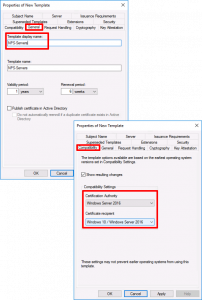 Certification Authority: Windows Server 2016 (Though 2012 R2 will work). Certificate Recipient: Windows 10 (Though Windows 8.1 will work). ADD: VPN-NPS-Servers: GRANT: Read, Enrol, and Autoenroll. DELETE: RAS and IAS Servers. 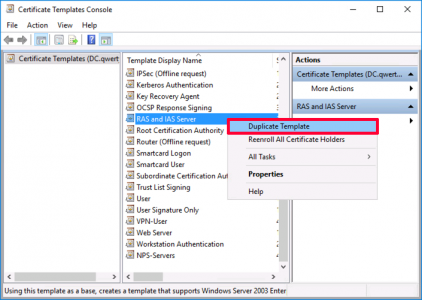 Apply > OK > Now make a second duplicate of the RAS and IAS certificate template. Edit > Add > IP Security IKE Intermediate > OK > OK.
ADD: VPN-RAS-Servers: GRANT: Read and Enrol ONLY. Supply In the Request: TICK (Accept the warning). Issue Both of the server certificate templates. In the’ Group Policy Management Console’ create a new GPO, I’m simply linking it to the root of the domain, you can of course link it to the OUs that your RAS and NPS servers live in. Navigate to: Computer Configuration > Policies > Windows Settings > Security Settings > Public Key Policies > Certificate Services Client – Auto-Enrolment > Properties. 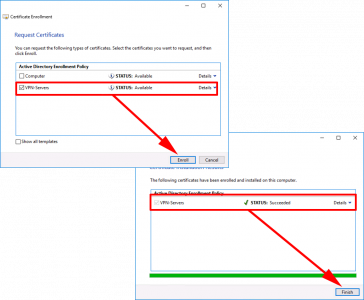 Renew expired certificates, update pending certificates, and remove revoked certificates: TICK. Update certificates that use certificate templates: TICK. Close and exit the policy editor. Now Im creating another policy for my USER auto enrolment, (I could have used the same policy above, that’s linked to the root of the domain, but I like to keep them separate, it’s your choice). Anyway just ensure the policy is linked to your USERS. 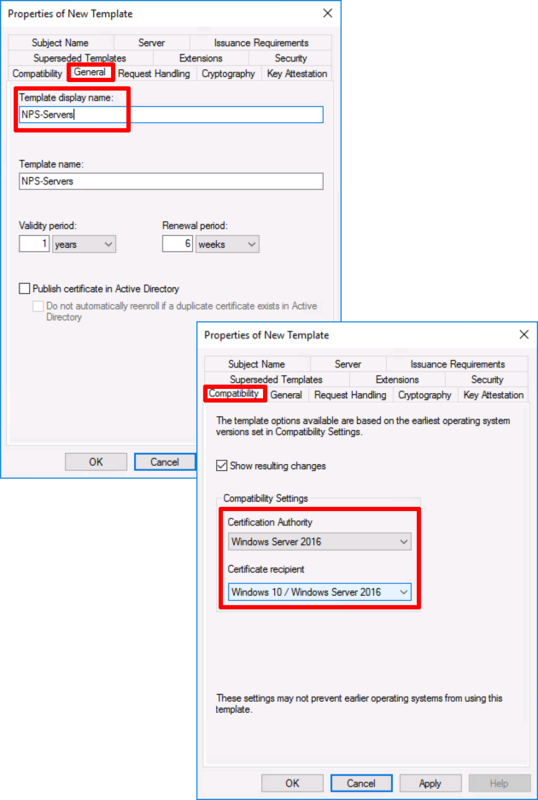 Navigate to: User Configuration > Policies > Windows Settings > Security Settings > Public Key Policies > Certificate Services Client – Auto-Enrolment > Properties. 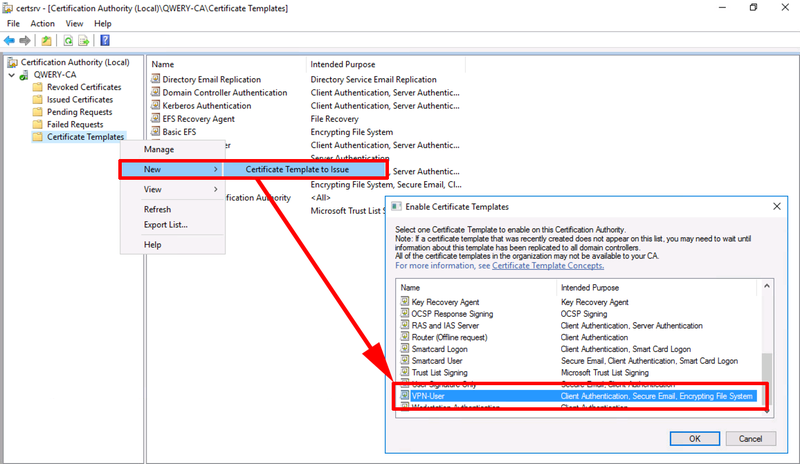 NPS-Servers Certificate: Windows Key+R > certlm.msc > Personal > Certificates > You should have a certificate based on the NPS-Server template. 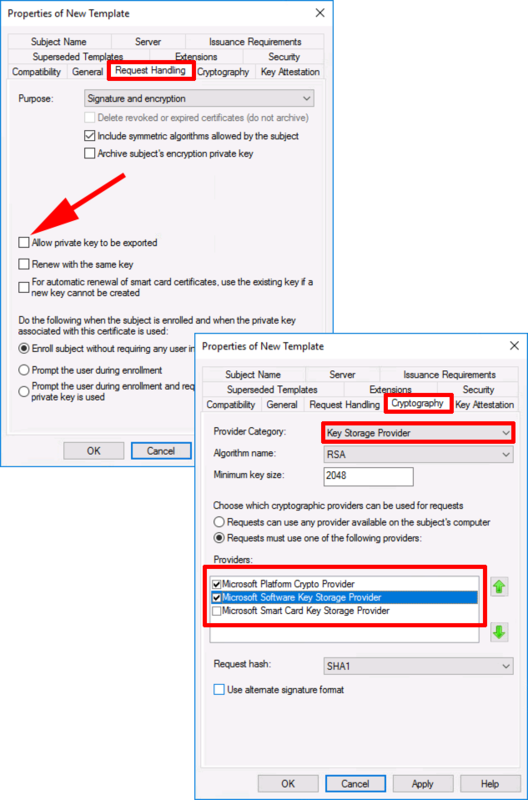 VPN-Server Certificate: Windows Key+R > certlm.msc > Personal > Certificates > All Tasks > Request New Certificate > Next. 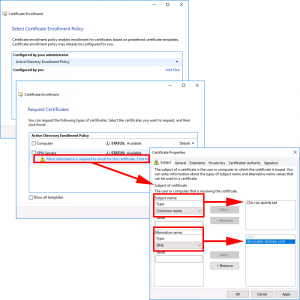 Note: You are doing this one manually, because this certificate does not auto-enrol, that’s because the certificate will need a different common name on it, (the public DNS name of the RAS server). Next > Click the ‘More information…’ link > In the Subject Name Section, Set the Common name to the private DNS name of the RAS server. In the Alternative name section set the DNS value to the public name the server > Apply > OK.
You now have a certificate based on the VPN-Server template. 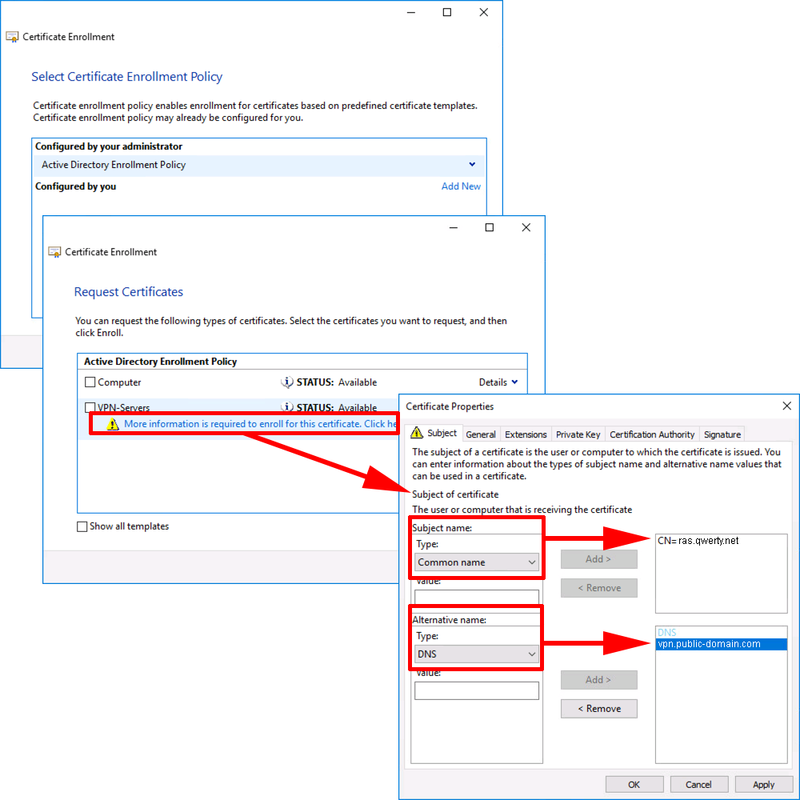 VPN-User Certificate: Just a quick note, on the Windows 10 client, run certlm.msc again but this time ensure you have your domain CA server certificate listed in the ‘Trusted Root Certification Authorities’ folder. 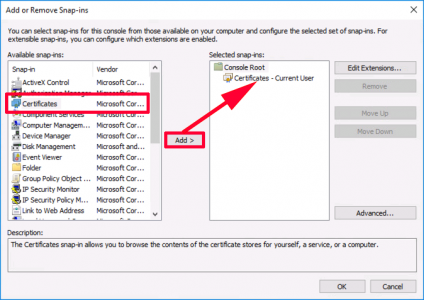 Now this console lists computer certificates, and we need to look at user certificates (I could just run certmgr.msc instead), but old habits die hard, so I’ll launch an mmc console > and add a snap-in. 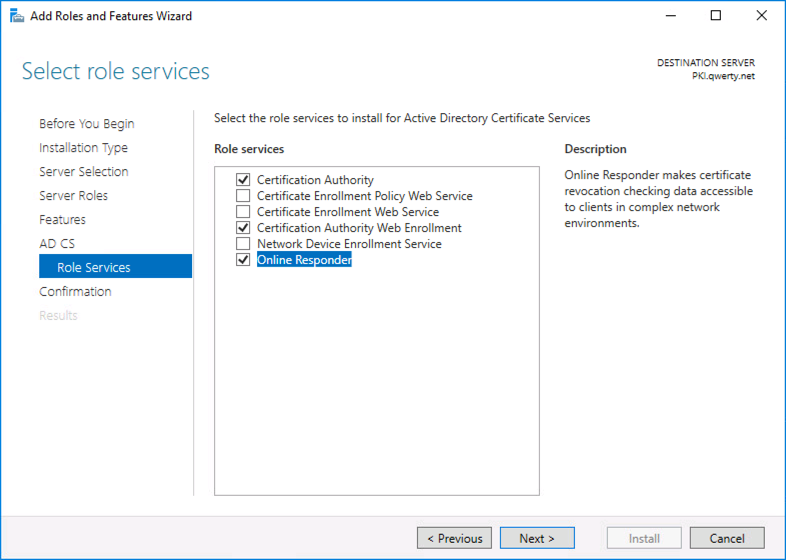 And add ‘certificates’ (Note: If I were an administrator I would be prompted to choose computer or user certificates, as I’m just a user, then current user is selected by default). > OK.
And there’s my certificate based on the VPN-User template. If you’re struggling, and the user certificate refuses to appear, read my note (above) about e-mail addresses (that’s a very common error that causes auto-enrollment to fail). For troubleshooting look in the Event logs and in the ‘Failed Requests’ Section on your CA server. For all certificates, if something isn’t working then either somethings in the wrong group, the wrong group has been given permissions on the certificate template, or the GPO is linked to the wrong location. That’s it for Part One, in Part Two I will look at deploying my RAS/VPN server into my DMZ, and having a rant/sneer at Microsofts continuing policy of trying to bypass my firewall. A massive thank you to Joseph Moody, and Kevin Kaminski, fellow MVP’s who took the time to reply to my Always On VPN queries. I wondered if you could help me get my head around the VPN(RAS)/NPS Servers and the Auto-Enrol/Enrol on Certificate Templates? 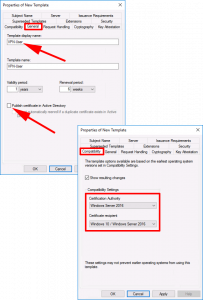 My evaluation of this version of VPN by Microsoft resides on two servers (Not including Active Directory and PKI Servers already being utilised) The NPS server is on my internal domain and the VPN/RAS server is in my DMZ. Your documentation states I have to add the VPN Server Group to the Security tab of the Template however that VPN server doesn’t exist within the internal domain so fi thats the case how would I work around this or will I need the VPN server to reside in the internal domain as well? Maybe a good idea to mention that if your PKI is issuing SHA1 certificates, you get 812 / 20227 events on your client, And error 20255 and 20271 in the system log on the RRAS server.